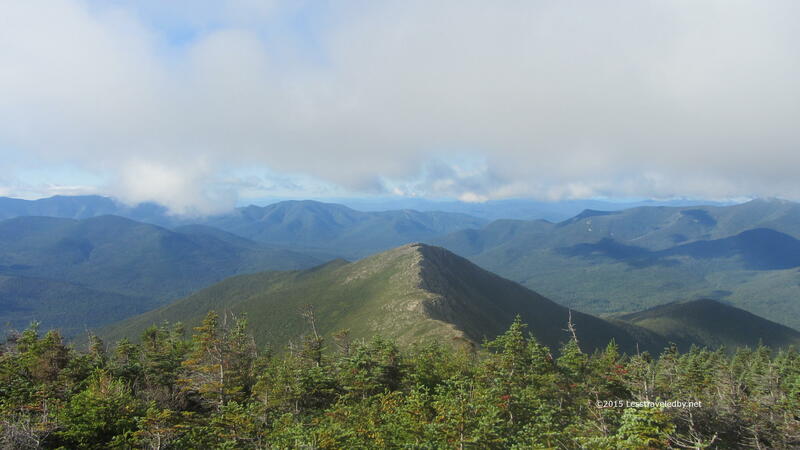 Somewhere along the way I noticed that all of these trips exploring the Pemigewasset Wilderness were starting to add up. 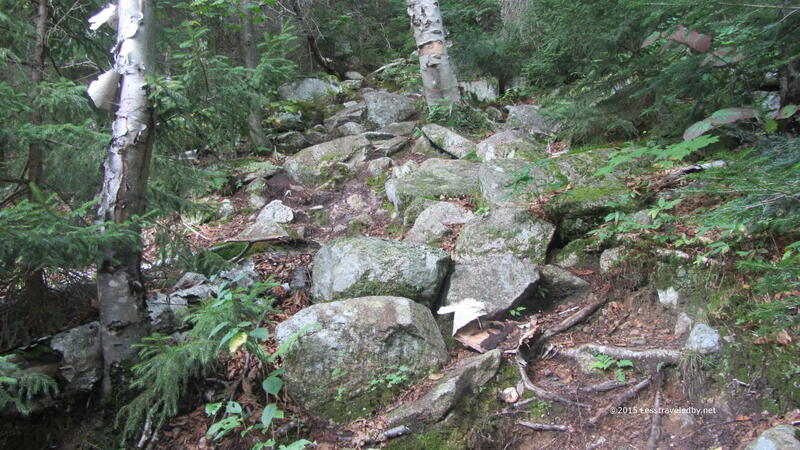 Looking at my map I could see I had covered a large portion of the trails. From there it just seemed natural to try to cover the rest of them. 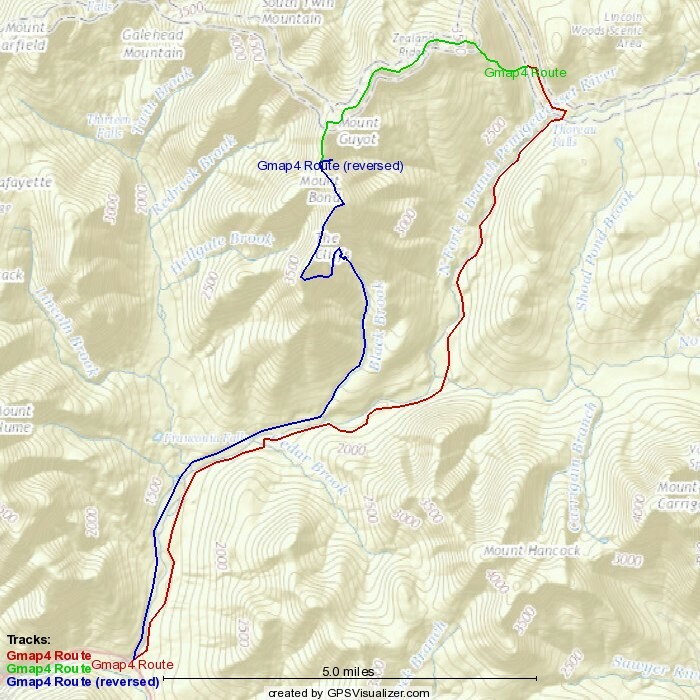 Hitting every trail within an area like this is known as redlining from the act of marking completed routes on a map. 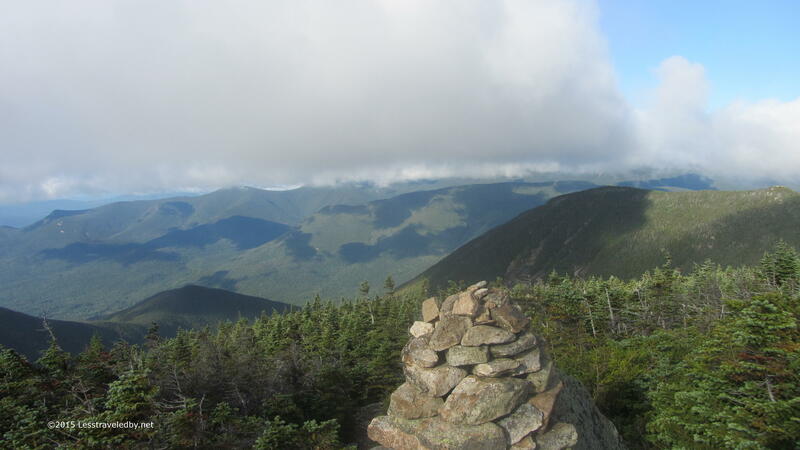 My version includes a caveat that the trails have to be walked as part of a backpacking trip rather than day hiked. This sort of thing is a fun game to play with yourself, much like peakbagging, but without the summit crowds. Redlining will take you to the popular summits, but it also takes you to a lot of other places where folks don’t usually go. The downside to redlining is that it takes you to trails that you may have previously decided you’d never be crazy enough to do. This is the story of such a trip. 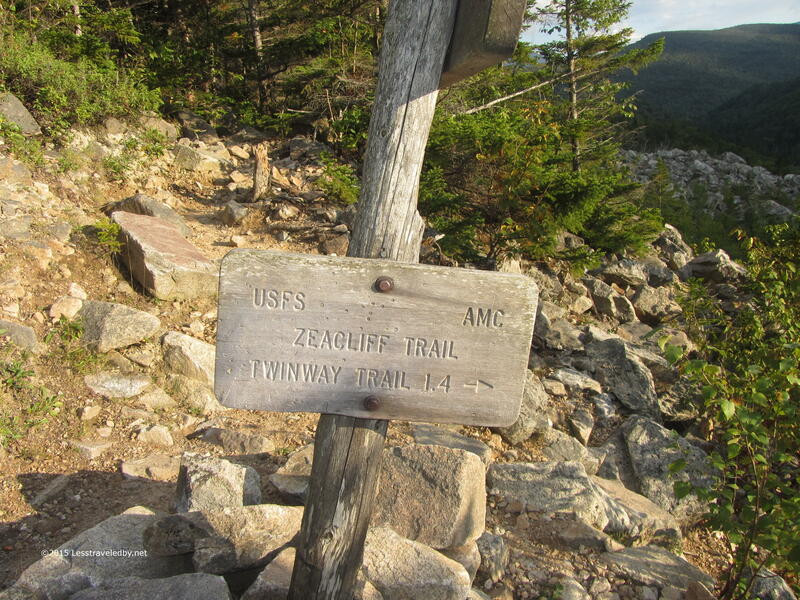 When I first started visiting the Pemi a few years back I noticed the Zeacliff Trail and did some research on it. From what I found it sounded like my worst nightmare and I laughed at the idea of ever climbing it at all, let alone with a full pack. 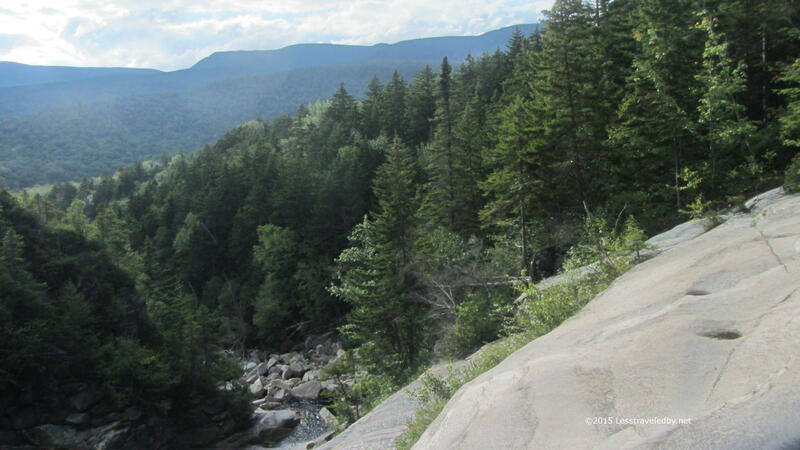 The plan was simple enough…head out from the Lincoln Woods TH and up the Thoreau Falls Trail to spend the first night at the base of the cliff. The next day I just had to get to the top and head to the Guyot tent site where I’d spend the second night before heading down via Bondcliff. 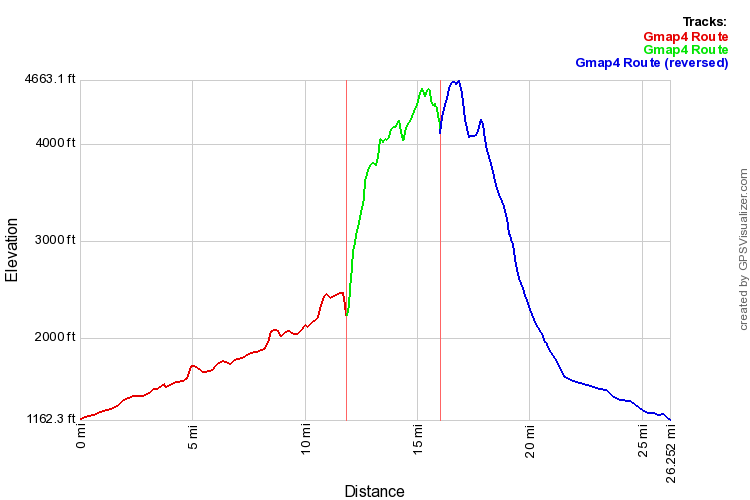 With days of roughly 12, 5 and 11 miles it sounds simple enough unless you look at the elevation profile. As an old fat man I always look at the elevation profile when planning a trip so I knew what I was in for. I packed light in terms of clothes and gear, but made a point of bringing good food, including a special treat that will come up later in the story. I left the scoot in front of the ranger station in what has become my regular spot and headed out at a good clip. I knew 12 miles was pushing it with the late start I get after my long ride, but I really wanted to camp right at the cliff to get an early start on it. I’ve covered the East Side / Wilderness route numerous times so no pics to share on this trip. 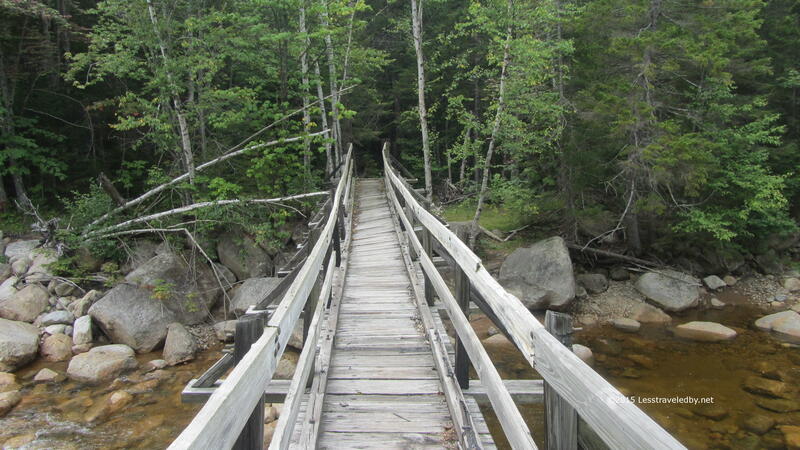 Always have to include pics of the Thoreau Falls bridge though. 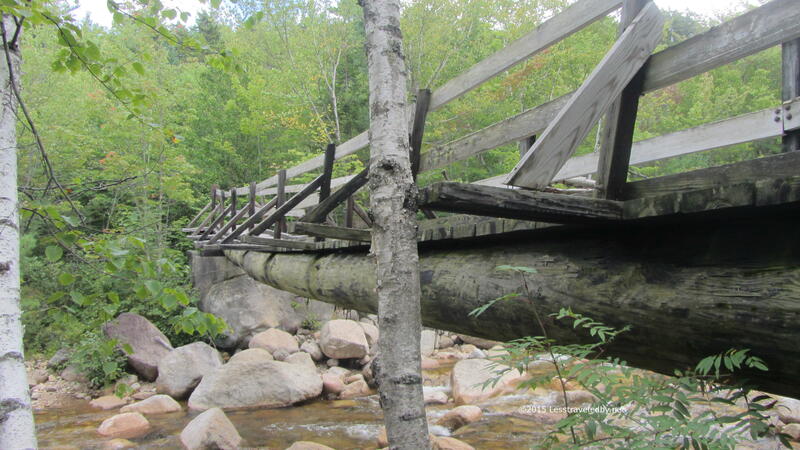 There has been talk of removing this old beauty due to one of the stringers being damaged. Hopefully that will be reconsidered and a suitable replacement can be built. As the only viable high water and winter crossing it is vital to allowing hikers and skiers to visit and enjoy the wilderness. Hopefully they can create one rustic looking as befits this spot deep in the woods. The old one with its giant tree supports and weathered deck boards certainly looks at home here. It definitely has become an old friend over the years and even if replaced I’m going to miss this old one. 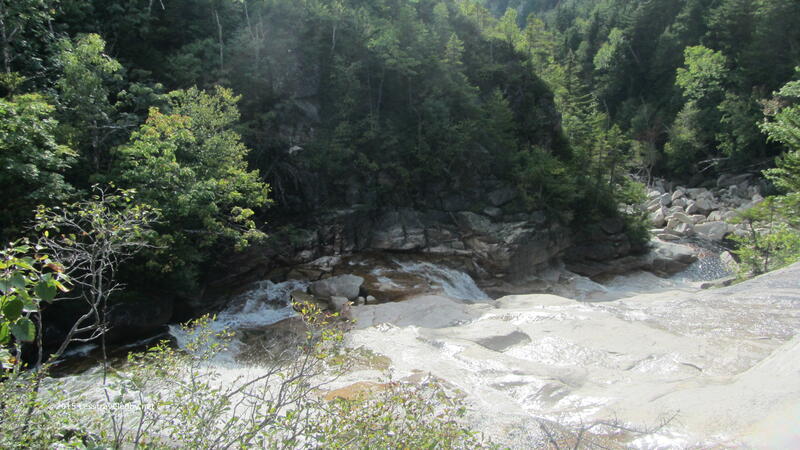 The falls still were running higher than usual for the time of year due to a recent storm, but you could see signs the water had been much higher the day before. A couple of Forest Service surveyors caught up with me taking a snack break here. They were out tracking forest growth, but were headed out after a long day of bushwhacking. I stuck around to enjoy the view for a few more minutes. Well and some more snacks too of course! There has been a lot of progress made on improving my menu between breakfast and dinner this year. Have to admit I’ve replaced dinner with snacks a few times because they are tempting, but that is better than not eating. Even with snack breaks I’d made pretty good time. 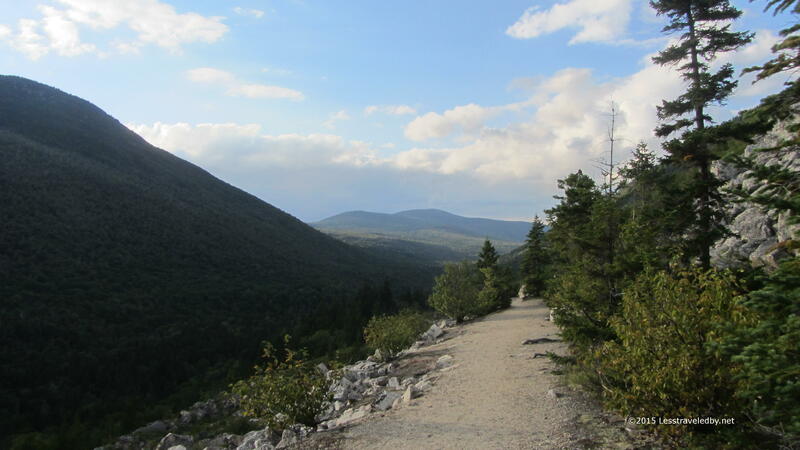 The sun was still above the mountains to my west as I walked along the Ethan Pond Trail where it opens up below Whitewall Mtn. The late afternoon sun looked great on the jumbled pile of rocks and the cliffs above where they’d started out. This trail is always a joy to walk on. 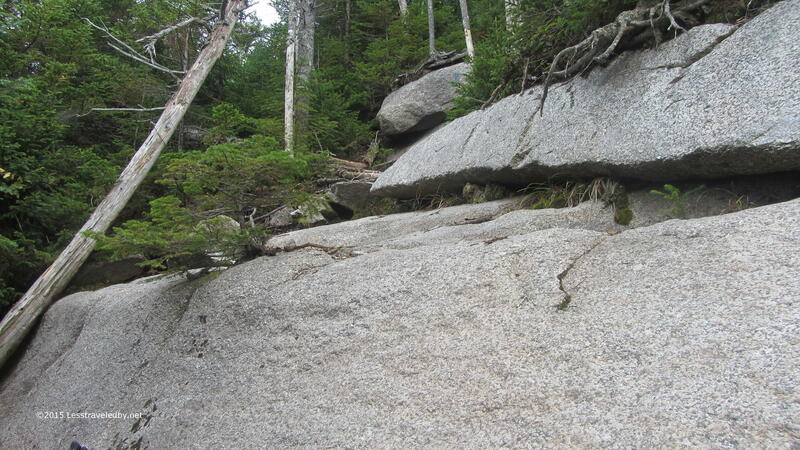 Smooth and level, you’d never guess it was in the middle of the White Mts. I could see the shadows gathering down below so didn’t get to spend as much time enjoying it as I’d have liked. Never having camped at the spot I was headed to I figured I’d better not linger. When passing this sign before I’ve always stopped to look at the pile of rocks that counts as the start of the Zeacliff Trail. A narrow break in the low scrub and scattered signs of human traffic were the only guides. 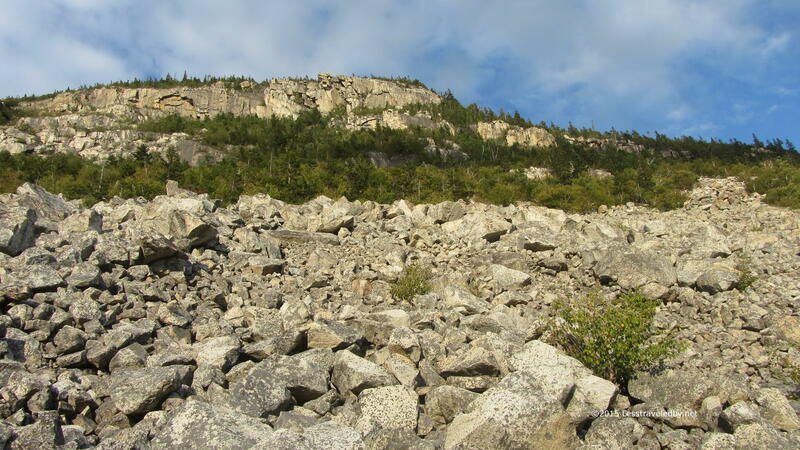 This pile of rocks was both unstable and very steep in places making for a very slow descent. By the time I reached the bottom the light was going fast so I didn’t stop to take pictures. First I headed off the trail to the south where I’d been told there were some good sites. Along the way I found some bad sites where lazy people had camped and crapped right next to the trail. Then I came to the spot I’d been told of and while I could see it had been used many times at least the folks who came this far didn’t leave their poop laying around. It took some effort to find my way back to the water I could hear nearby, but eventually I followed the right herd path to reach the Whitewall Brook. Despite looking clear and pristine I followed my usual protocol and filtered a few bags of water since I knew animals had been pooping in the woods upstream heh. The night was very restful other than a bright full moon that actually woke me up a few times. I had to face the other way until it finally disappeared behind the mountain. Leaving the roof off to enjoy the view has downsides too sometimes I guess. 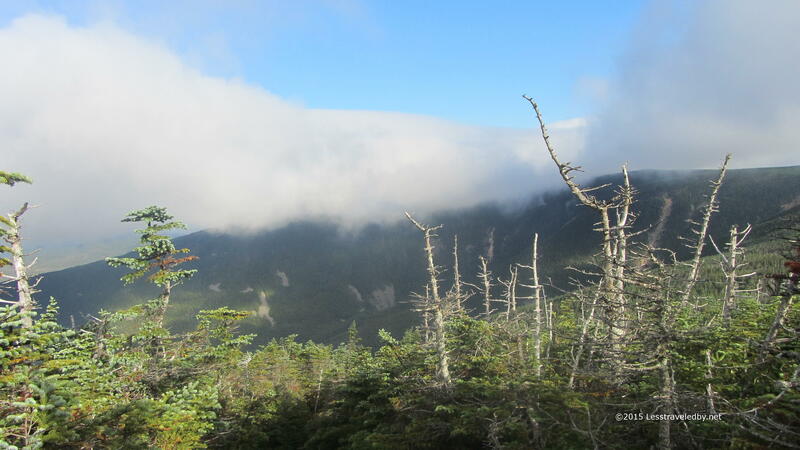 The next day I was treated to the sound of early morning hikers passing above my head on the AT. They had no idea I was still tucked under my quilt envying the flat trail they had ahead of them on their way towards Ethan Pond. I on the other hand was headed up. There aren’t a lot of pictures of the climb because pictures really don’t convey the reality very well. That and I was sweating pretty good and didn’t want to short out the camera heh. There were two definitely steep sections separated by some easier climbing, but no real respite until the top. Thankfully it wasn’t a very hot morning because I was working hard. This was my first trip in about a month due to a long family road trip. The legs had lost a lot of strength from the lay off and weren’t very happy about having that pointed out. I just stopped and laughed when I got to this spot. The first ledge was about head high so wasn’t my first guess as to where the trail would be heading. Then I noticed an old blue blaze on a rock several ledges higher. Luckily there was a crevice I could get some hand holds on so I tossed my poles up and did some actual climbing. I’d like to say that it was over all too soon, but really, I was pretty dang happy when I got to the other end of the trail at the Twinway intersection. Sitting down to celebrate my successful ascent with a well earned snack I was soon greeted by the first of many folks I’d meet on this busy trail. 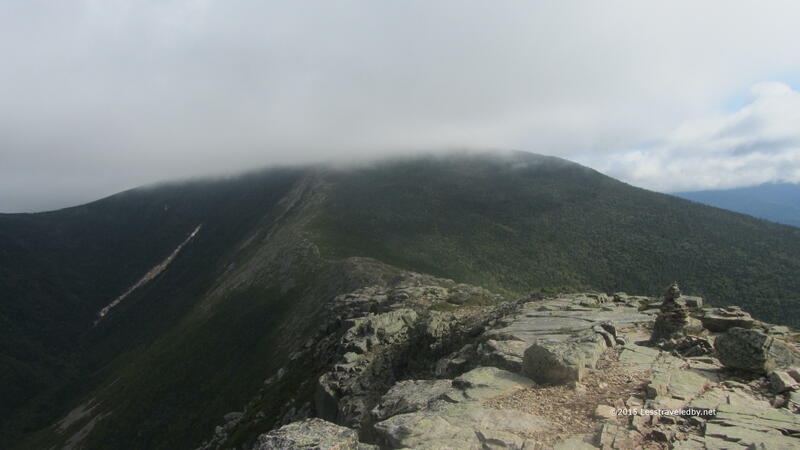 There were families out for a day hike from the Zealand Hut down below, thru hikers headed towards Maine and a fair number of folks headed towards the Bonds as I was. The weather was acting up a bit as I approached the top of Guyot Mtn with low clouds and a bit of mist at times. Clearing the summit the wind was pushing the clouds right into the ridge so I was glad when I made the turn off of the AT and put it at my back. 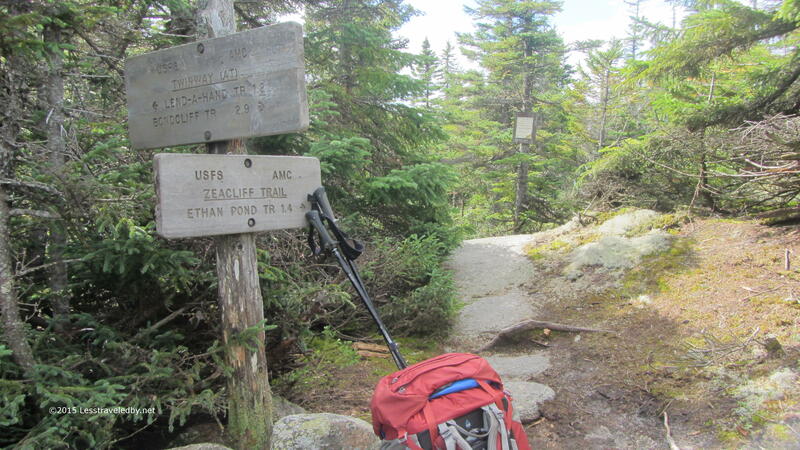 By the time I reached the tent sites even a hot hiker like me was feeling the wet chill. The same nice caretaker I’d met on my previous visit was on duty which I was glad to see as I’d come prepared to repay her kindness. Since she had been nice enough to share her coffee with me last time I returned the favor by making her one of my famous cocoacinos. Then just to show I’d been paying attention, I gifted her with a couple of Snickers bars I’d picked up for her since she’d mentioned they were a favorite. Food makes a very nice gift for someone stuck on top of a mountain so if you ever get the chance, bring them some! The next day the sky had cleared some, but there were still a few clouds bumping into the mountains. I enjoyed coffee and breakfast in the communal area and then headed up to the Bond summit. My legs were very cranky, especially the quads. The long layoff followed by the hard climb had really taken a toll on them. Mercifully the climb to the summit is less than a mile and not that hard other than the climb up to the trail from the camp. 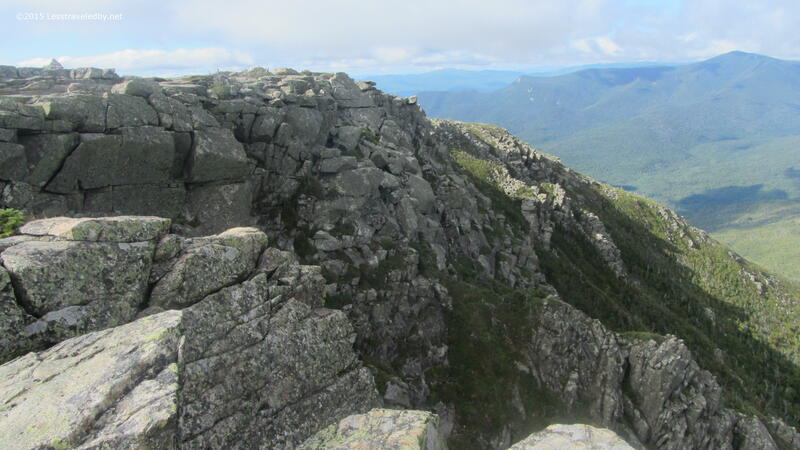 Even my cranky legs were happy with the summit views. The clouds were near, but not on my head. The shadows made for great patterns on the already interesting landscape. It would have been a great day to linger there, but as the saying goes, I had miles to go before I could sleep. Looking down from the summit toward the cliffs always puts things into perspective. The stone cliffs seem very different from here than they do up close. Whether I’m headed up or down I always trace the trail over the ridge and thinking about being there looking up this way. This area really has become a new favorite spot for me. The views stay almost entirely within the mountains. 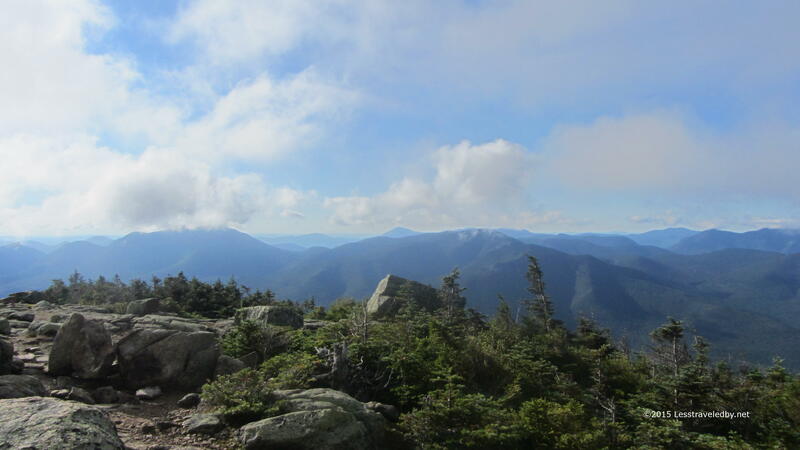 Other than the Loon Mtn ski runs and the towers on Mt Washington when you can see that far, civilization is obscured by the wilderness peaks and valleys. The cliff face in shadow shows a bit more depth to the cracks. This is another spot I could spend some time watching shadows move if I didn’t have to keep moving. Some extended time up here is in order I think. It might take a few days to really see it. Looking back to the summit the clouds had moved back in. Just as well I had only time enough to enjoy the view and move on it seems. This was a quick trip and as planned quickly over. My goals had been to climb that cliff trail and to test out my legs. Both were met, though I wasn’t happy to find out my legs were no longer the stomping machines they’d been earlier in the season. Oh well, I guess that means more hiking trips need to be scheduled. Maybe some more redlining?